Karaite scholar; flourished at Constantinople between 1500 and 1540. His main work, which was highly esteemed by the Karaite scholars, was a poem entitled "Minḥat Yehudah"; it consisted of 1,612 verses ending in , containing all the Biblical commandments and written in the style of the rabbinical azharot. 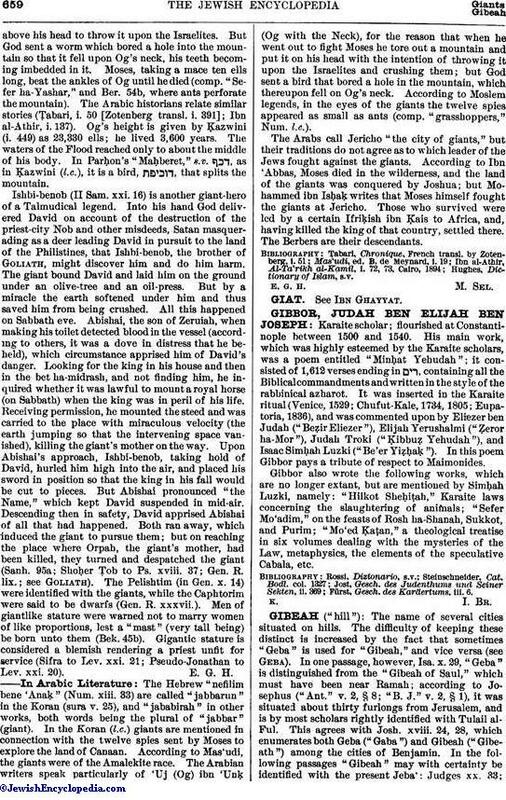 It was inserted in the Karaite ritual (Venice, 1529; Chufut-Kale, 1734, 1805; Eupatoria, 1836), and was commented upon by Eliezer ben Judah ("Beẓir Eliezer"), Elijah Yerushalmi ("Ẓeror ha-Mor"), Judah Troki ("Ḳibbuẓ Yehudah"), and Isaac Simḥah Luzki ("Be'er Yiẓḥaḳ"). In this poem Gibbor pays a tribute of respect to Maimonides. Gibbor also wrote the following works, which are no longer extant, but are mentioned by Simḥah Luzki, namely: "Hilkot Sheḥiṭah," Karaite laws concerning the slaughtering of animals; "Sefer Mo'adim," on the feasts of Rosh ha-Shanah, Sukkot, and Purim; "Mo'ed Ḳaṭan," a theological treatise in six volumes dealing with the mysteries of the Law, metaphysics, the elements of the speculative Cabala, etc. Fürst, Gesch. des Karäertums, iii. 6.